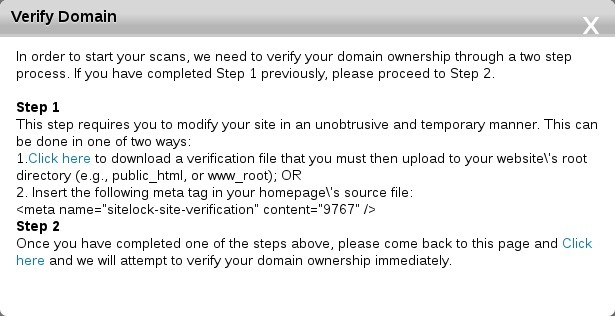 Note: You will be unable to verify your domain unless it is properly pointed towards your FastDomain account. Please verify that your domain is pointed correctly before continuing with this tutorial. After the file is downloaded, you will need to log into your FastDomain cPanel. Please keep your SiteLock dashboard open as we will need to comeback here after the html file has been uploaded to your account. Once logged in to cPanel, open the "File Manager" located in the "Files" section of your cPanel. Note: If you are still having trouble getting your domain correctly verified, double check that all the above steps were performed correctly and double check that your domain is pointed correctly. If you are still unable to verify the domain, you can contact support via phone at 888-210-3278 or Live Chat so we can verify the file is correctly uploaded, or you can submit a ticket directly to SiteLock using the "Support" link at the top of your SiteLock dashboard.